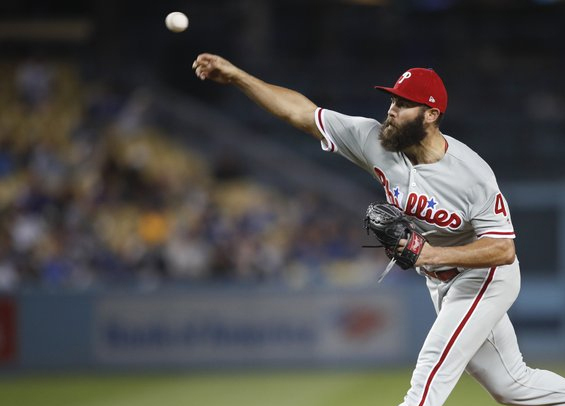 Jake Arrieta's effort on Tuesday night showed why this year's Phillies club is different than last. It was a rallying point at a time when the club desperately needed it the most. Monday's debacle was the exact type of loss that fueled a prolonged tailspin last year that saw the Phillies lose more than 60 games over a three-month span. It happened at Dodger Stadium. It happened when the team was riding a hot wave of momentum. The stage was set for the start of a similar downfall Tuesday. Arrieta, in a sense, stopped the bleeding from Monday's loss. That's why they sometimes refer to the ace as a stopper. A loss would have buzzed too close to the scar of a year ago. "You want to be a stopper," Arrieta told reporters in Los Angeles after tossing seven scoreless innings in a 6-1 win. "Anytime you're in a situation when you lose a tough game, especially the first game of a series, you want to come out and put a stop to it. That's what I intended to do." A split in Los Angeles with a quality team like the Dodgers isn't necessarily a bad thing, particularly when you're only sitting a game behind the pace in the NL East. Zach Eflin takes the mound Wednesday night for the Phillies, aiming to pitch beyond the fifth inning for the first time since May 7 when he tossed 6 2/3 scoreless against the Giants. He's faltered in his past two starts, pitching to a 6.75 ERA. The Dodgers counter with right-hander Ross Stripling who is coming off a 10-strikeout performance against the Padres last week. He's pitched in 16 games for the Dodgers but started just five to go along with a 2.42 ERA. Pedro Florimon fouled a ball off his right foot on Tuesday and suffered a fracture. The Phillies placed him on the 10-day disabled list Wednesday afternoon and selected the contract of infielder Mitch Walding from Triple-A Lehigh Valley to take his spot on the 25-man roster. Walding, 25, was hitting .272 with seven homers, 20 RBIs with the IronPigs. To make room for him on the 40-man roster the club moved Jerad Eickhoff to the 60-day disabled list.